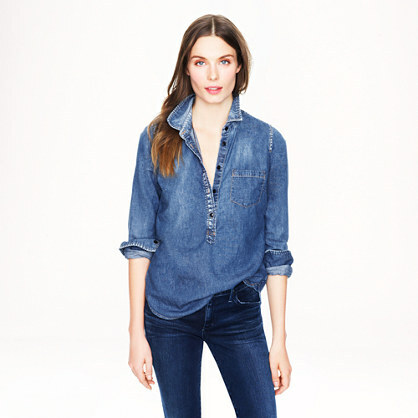 We love our jeans and what’s not to love about our indigo darlings in every shape or form? That’s why double denim is just so fantastic. Far from cringe-worthy cowboy fashion of yesteryear, it is a wonderful way to look supremely relaxed and cool. And the best bit? You can’t go wrong! Bubbly you’ve GOT to help me!!! 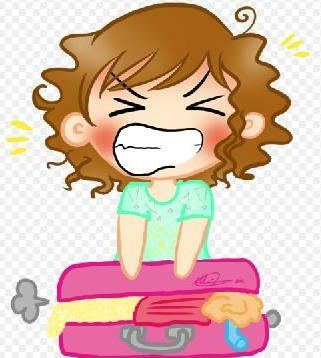 That was my sis as she thought of packing for her ten day holiday (3 days before the departure date… a little extra notice would help). And another friend told me that she recently returned from a trip to Mexico exasperated as nothing she packed went together and she simply couldn’t create looks she was happy with while she was there. There’s no doubt about it, holiday packing can be stressful. 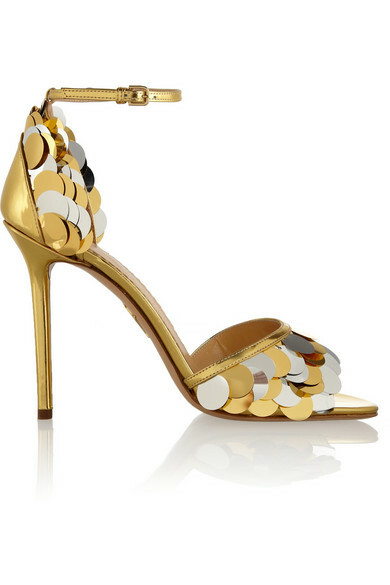 Leilou strip leather sandals by Sophia Webster £430. 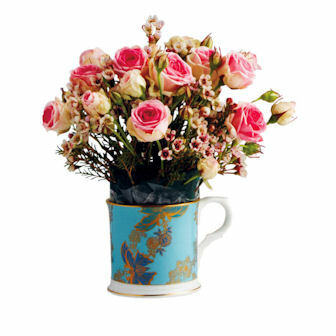 Aren’t these crazy cool in an AbFab kind of way? 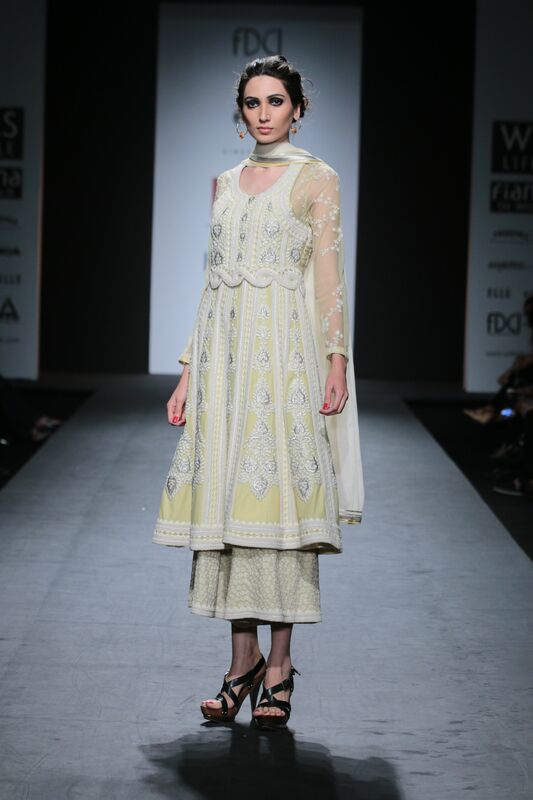 Intricate adornments from Pompeii all the way to Medieval church facades…Indian designer duo, Panjak & Nidhi seemed to thoroughly enjoy researching the inspiration behind their Spring/Summer 2014 collection. 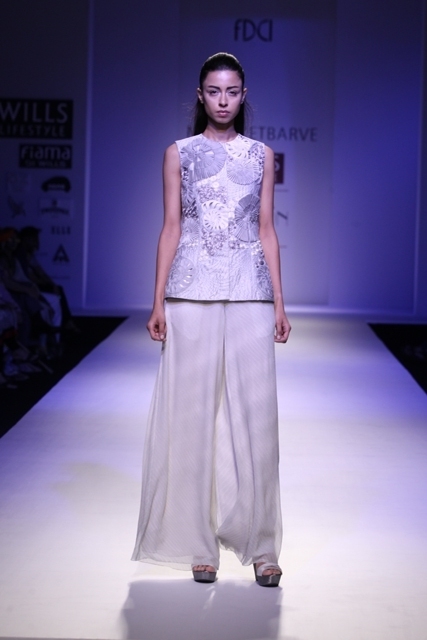 Hand cut fabrics appliqued to give a 3D effect and transparency were key looks. Fashion, flash bulbs and lots of flapping around. You probably heard all the fashion weeks started a few weeks ago. I left it til near the end to summarise what you need to know as consumers (this article is part 1 of 4). For all the attention that the official fashion weeks get, they are nevertheless trade events and not open to the public. They are extremely photogenic events to pepper media cycles routinely filled with political scandal and daily humdrum. Two’s Company, Three’s a Party! 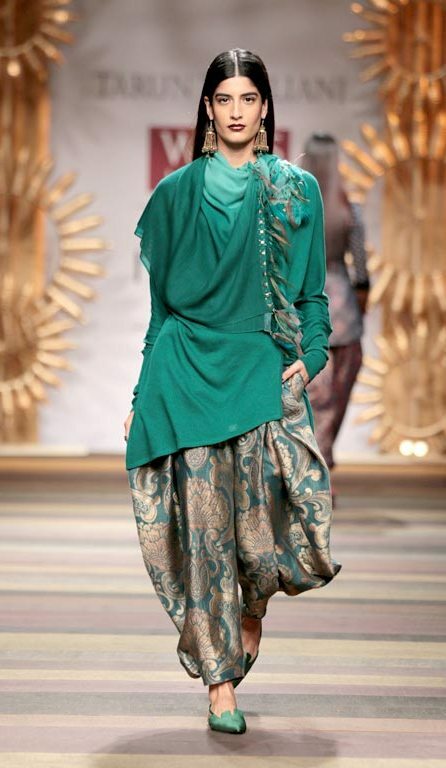 Calcutta-based designer, Sabyasachi, can best be described as the Marni of Indian fashion: quirky, off kilter, contemporary and highly relevant fashion for women that don’t do fashion. 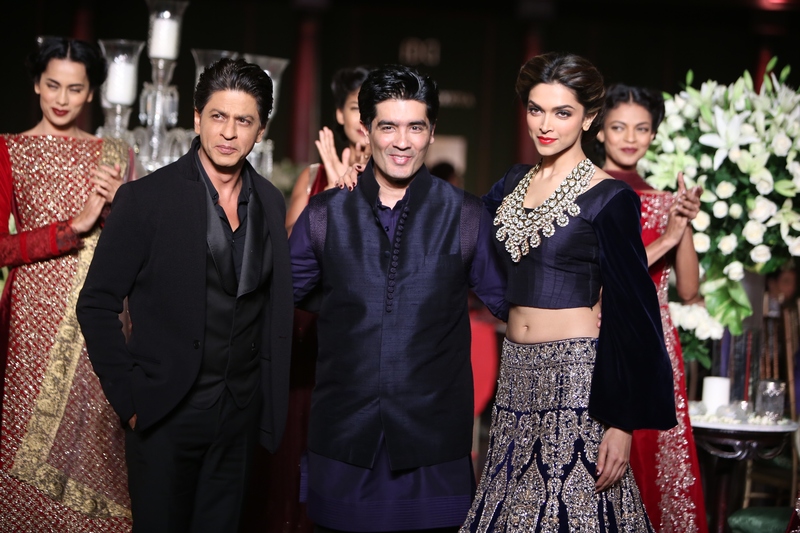 He has a loyal following and is much like fellow designer Manish Malhotra in his influence over general Indian fashion. What we see on the catwalk one evening will be copied the length and breadth of India the following lunch time (hardly anyone hits the haberdashers before then!). A new fashion label sketch london invited me to their fashion preview tonight (Wed 17 July) at the White Swan Pub on Fetter Lane, London. 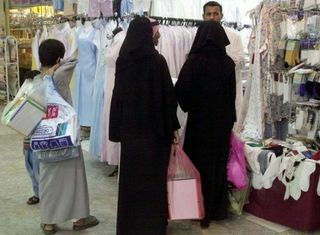 Claiming to be fashion trend-led and low cost whilst being produced ethically I hope the clothes are as fab as they look in the photographs. Only 8 Pairs of Shoes? Actress (or actor?) Emma Watson revealed that she only has eight pairs of shoes. I don’t believe her at all, I don’t know ANY woman in my entire extended circle of friends and family even ten times removed who only have eight pairs of shoes. Her statement led to the inevitable glut of fashion editors declaring the only eight pairs of shoes that any woman may ever need. 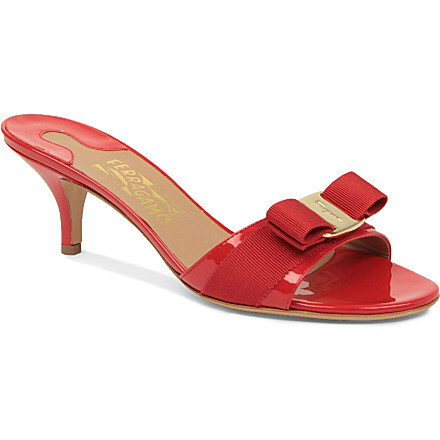 Some of the lists include Geography teacher (aka Jesus) leather sandals and trainers. I own neither. 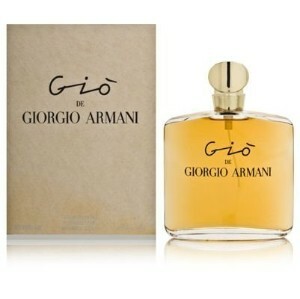 My most favourite perfume in the whole wide world is Gio di Giorgio Armani. Every single time I wear it and without exception men and women comment how amazing I smell and ask what the perfume is. The awful thing is that it is actually discontinued!! Can you believe it? 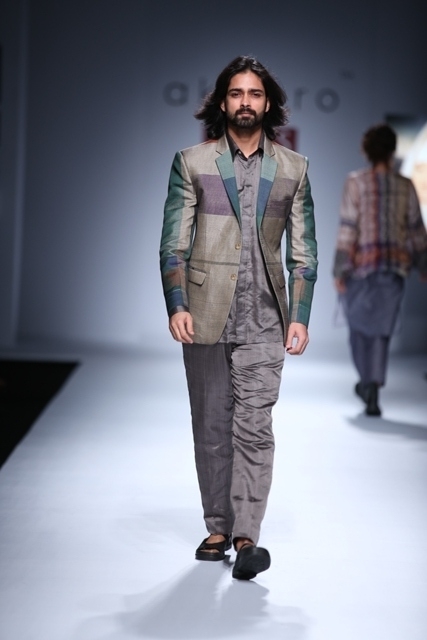 Designer Rajdeep Ranawat’s collection was inspired by a hypothetical world with a hint of exotic Medieval. 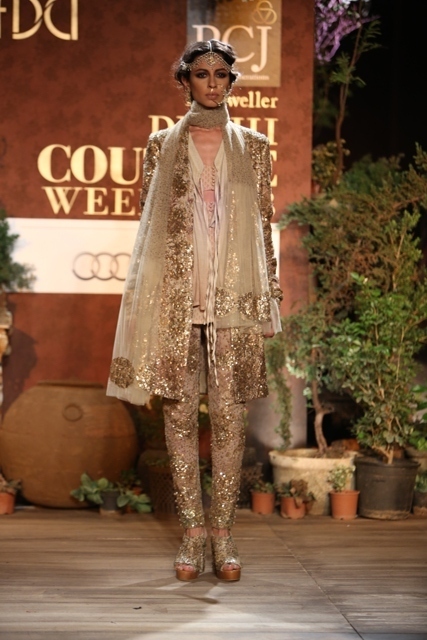 The collection featured intricate embroideries and lovely accessories. The Elton John embellished glasses were my favourite. 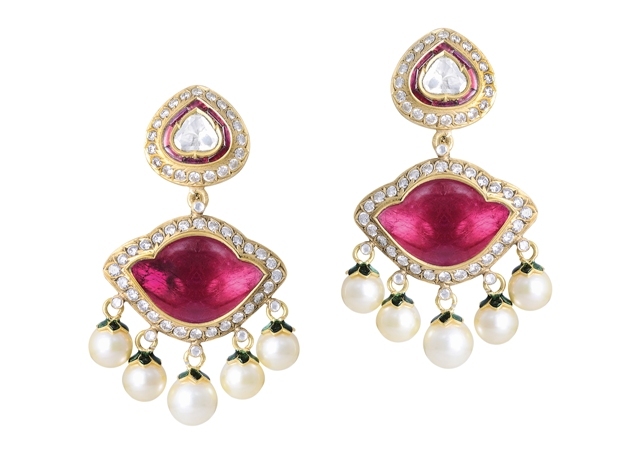 Kavita Bhartia is the owner of the Ogaan chain of boutiques with stores in Delhi and Mumbai. 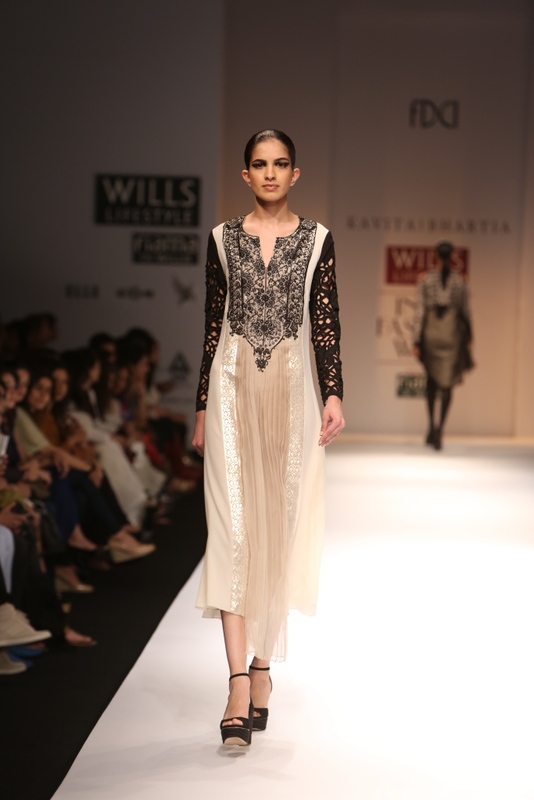 Kavita started her own label in 2001. The collection she presented this season was entitled ‘Hypercraft’ to reflect her combining technology and craft for her designs. I have a love-hate relationship with Kiehls, some of their products are so over-priced and mediocre, reference to all their lipbalms. However, Please may I recommend the Midnight Recovery Concentrate by Kiehls? It is awesome and a new must-have on my bathroom shelf. If you’re freezing your socks off in Britain just now I’m going to apologise for this recommendation as you won’t need it for a while yet, however, I’m in Delhi and the sunshine is rocking! 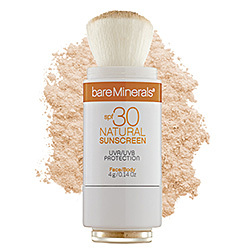 This also means it’s time to get the SPF creams on but I only used to wear SPF 15 as I found anything heavier gave me breakouts and made my skin shiny and greasy – not a great look. ‘Dewey’ only looks great in magazines. The latest British High Street chain to offer a celebrity collaboration is River Island who commissioned Rihanna and her stylist to design a 120 piece collection. 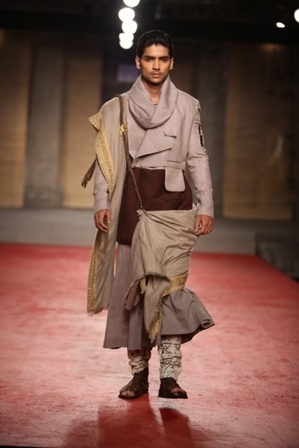 Debuting at London Fashion Week this was an extremely high profile launch for the range. A market that I regularly go to in Delhi is undergoing some renovation or something like that. In a large part of the market the pavement in front of the shops has been completely removed and a huge pit has been dug the length of the road. 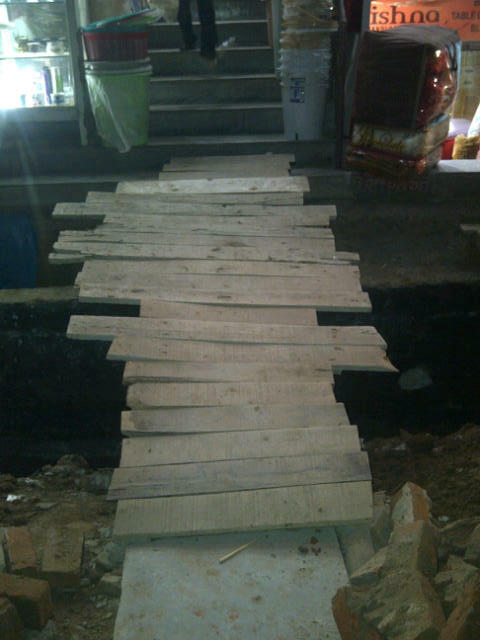 I just wanted to buy some cups but had to gulp and climb this hastily patched up plank of death that was wobbling! Christmas is a time for spiritual reflection and prayers for peace… Recall and cancel: Christmas means big business and high expectations to please and be pleased. Wrinkles never looked great on anyone and squinting in the sun or from the glare of beautiful pure white snow means you will need to get your sunnies on. 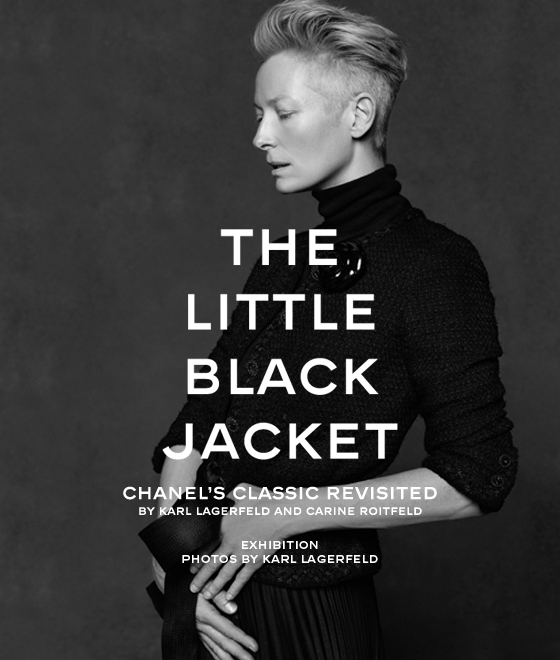 A celebration of the Chanel little black jacket is currently on at the beautiful Saatchi Gallery in London. Karl Lagerfeld was at the opening of the exhibition he organised in collaboration with Carine Roitfeld. The exhibition is on until 28th October and has arrived in London after a world tour including Tokyo and New York. The iconic jacket is an original Chanel design but is has stood the test of time and still has an irresistable charm. So said fashion icon, Diana Vreeland and how right she was! Whilst there was plenty navy blue in the recent fashion weeks showcasing next season’s Spring/Summer collections we will soon see if there is just as much pink in India’s fashion presentation. If you’re going to be drowned in Britain’s biblical April showers why not do it in style? 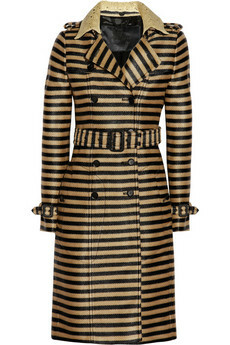 Only £1895 this wonderful Burberry Prorsum trench coat is so gorgeous you will actually cross your fingers and wish for rain. 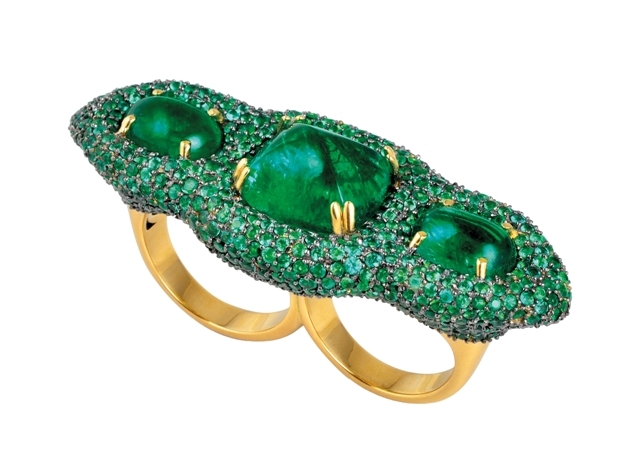 Available on Net-a-Porter. Secret Santas are great fun but can be quite tricky if you are buying for someone you don’t really know. In the past I have had great Secret Santas andbad ones!!! 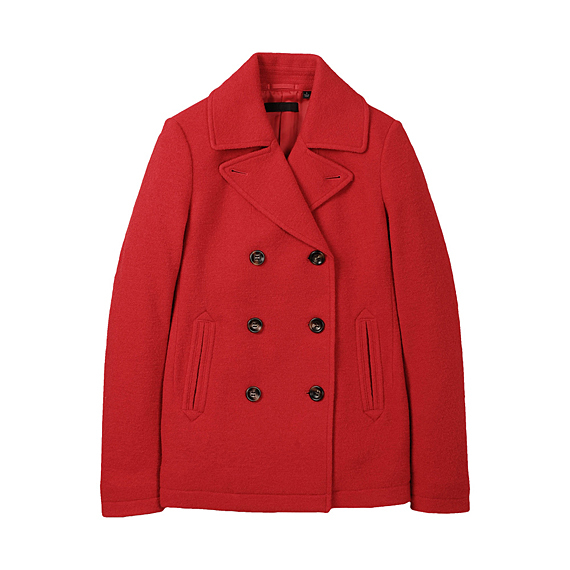 Red pea coat from Uniqlo, £89.90, also looks cute in navy. We often say, “you get what you pay for” but do you really? My recent shopping experiences in some high end retailers has proved that you can pay a very high price to get very little. In fact, what you get for buying a £200 shirt is snubbed, tutted and a hand waiting for your credit card without even telling you how much you owe them. 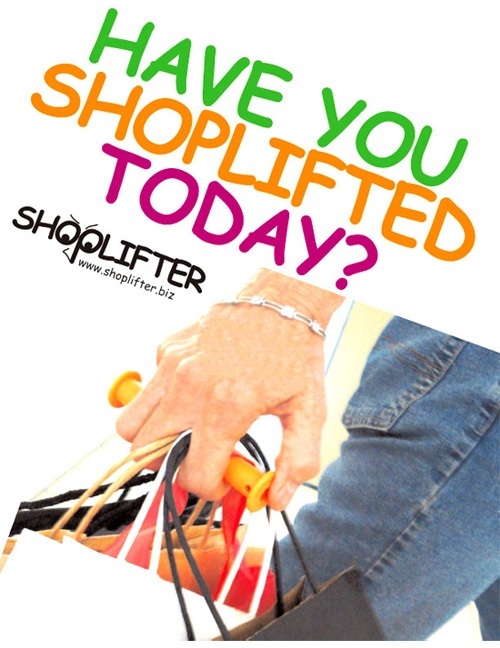 Have they never seen Mary Portas in Secret Shopper?